…and an online coupon code too! Several weeks ago, I received an email from Andy Kutcher of FSC Interactive introducing me to Sucré, in New Orleans, Louisiana, a confectionary, and on their web site for online orders: www.shopsucre.com. It is so nice that New Orleans now has a gourmet artisan chocolatier to call it’s own, since opening in April of 2007. 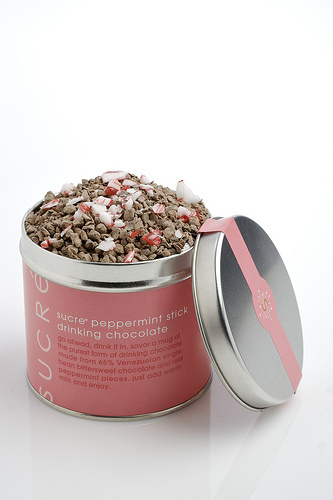 From breakfast to a midnight snack, Sucré is available to satisfy your sweet tooth. 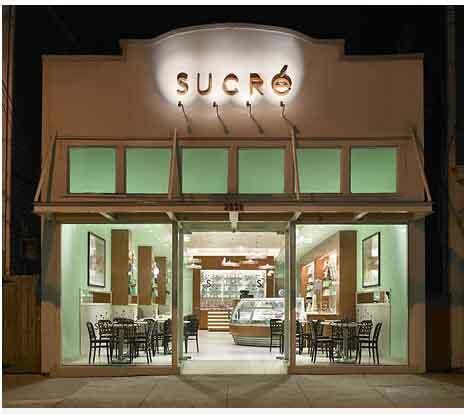 Sucré (French for sugared) is an emporium of “artisan” sweets. Unlike a traditional bakery, Sucré serves plated desserts with custom garnishes in addition to boxed treats. Andy had a few samples of their confections shipped to our address and after opening the UPS box; we were delighted with two chocolate treats, the Pistachio & Rose Petal Chocolate Bar, and the Sucré Sugar & Spice Holiday Collection of truffles. 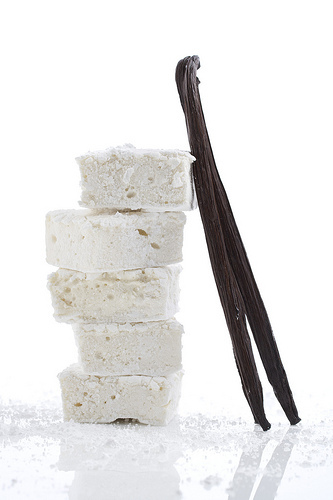 Everything Sucré creates is handcrafted in small batches and inspired from local, homegrown flavors. This holiday season they have teamed up with the Louisiana SPCA and a portion of every online sale will go directly to benefit the animals of the LA/SPCA. Sucré offers breakfast pastries, cakes and desserts, artesian chocolates, chocolate collections, French macaroons, confections, nuts, gelato and sorbets, beverages, seasonal and featured items, wedding and specialty cakes. The Pistachio & Rose Petal Chocolate Bar, which sells individually for $6.50 or $35.00 for a six bar gift bundle. Other chocolate bars available include Swirled Caramel & Salted Peanut Chocolate Bar, Maracaibo 65 Chocolate Bar, Candied Violet Chocolate Bar and Salted Pretzel Chocolate Bar. The Pistachio & Rose Petal chocolate bar consists of a smooth creamy milk chocolate that is embedded with toasted whole shelled Sicilian pistachios and candied rose petals on the one side and break-apart sections on the other side. A definite artisan chocolate bar here, the candied rose petals are delicate and lend a crunchy appeal to the smooth chocolate. The holiday truffle collection with 15 pieces, which are named the Sucré Sugar & Spice Holiday Collection, sells for $30.00. This collection includes fives pieces each of the Eggnog Dark Chocolate Truffle, Candy Cane White Chocolate Truffle, and Gingerbread Milk Chocolate Truffle. Each of these elegant truffles is special in their own way. The Gingerbread truffle has a bit of spiciness reminiscent of a ginger snap cookie, while the Eggnog truffle is very smooth and creamy, and the Candy Cane truffle has hints of the holiday treat. All of these truffles are a superior product and worthy of praise. 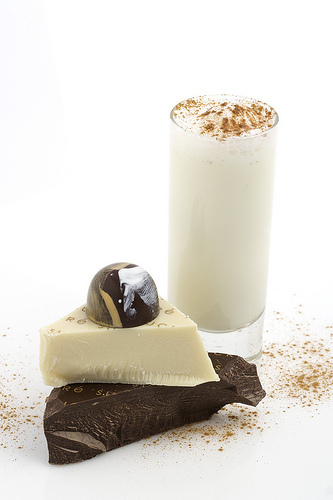 Other confections that Sucré offers include the Peppermint Stick Drinking Chocolate, the Vanilla Marshmallows, and the Eggnog Dark Chocolate Truffle is also featured in the images below. Andy asked me to pass on a special offer for anyone who orders from their site by December 23, 2009, and the offer code is applied prior to final checkout and is for $10.00 off orders over $70. my weakness is a pistashio and chocolate combo have never seen anyone else but Lindt make it, this looks so delicious with the rose petal,. love this! Oh I LOVE handmade chocolates!! This is making me miss NOLA so bad. I used to drive there after work to get gifts and sample a little bit of chocolate myself! That place is amazing. 🙂 Thanks for the code! oh man that is some great gourmet chocolates! I’ve been to Sucre – it’s amazing. Not only are their chocolates to die for, the space itself looks like a confection. It’s a great place. I think I know what I’m getting everyone for Christmas now!! How beautiful that rose petal & pistachio chocolate bar is! Love all those package styles as well… Taste always needs elegance! You’re so lucky to received those chocolates. They canceled mine. I think it’s because the shipping is way to far (Philippines) and it’s the holiday season and the product may get damaged upon shipping. I can relate how wonderful it is New Orleans has it’s own chocolatier. This post reminds me of my mother in law, who recently passed. She was a huge fan of fine confections. I remember when she found our newest local chocolatier, she couldn’t wait for me to try them. I wish she was still here, I would recommend Sucre to her. She would have surely bought us a box to sample! EVerything looks so good. I like especially the Peppermint Stick Drinking Chocolate. yum yum yum! Thanks for the info. I will have to swing by there when I am in the “big easy” in a couple weeks.